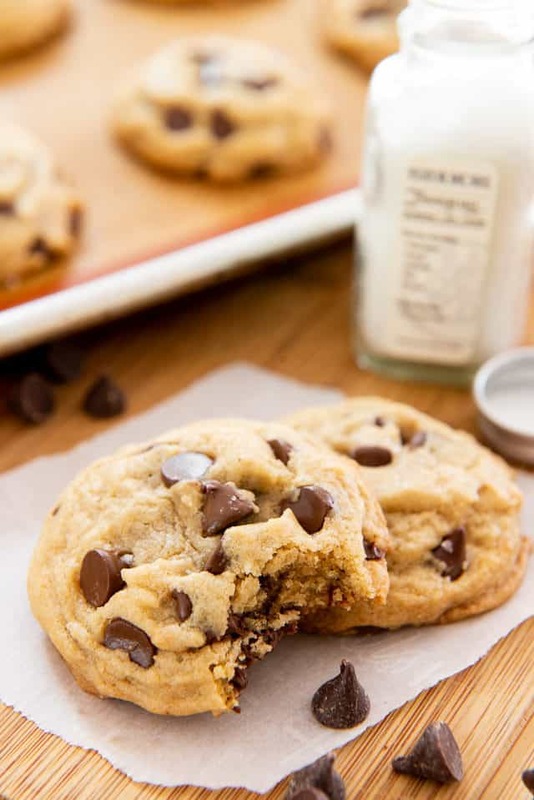 Chocolate Chip Cookie Recipe - Fast recipe with no chilling required! 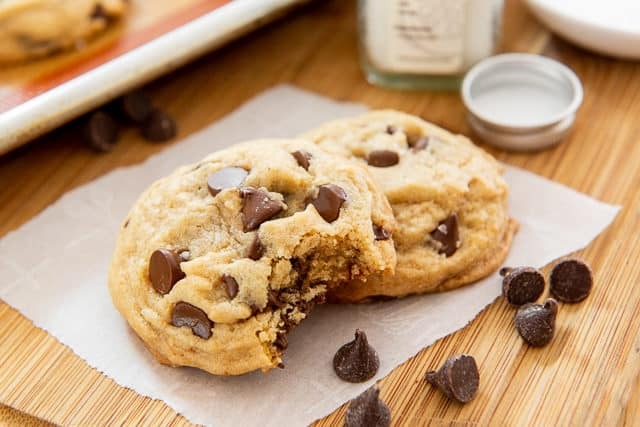 This is my go-to Chocolate Chip Cookie, with a soft and gooey middle, crisp edges, and a generous helping of chocolate chips. No chilling or wait time required. Having tried a zillion chocolate chip cookie recipes over the past 10 years, this one has solidified its place as the most satisfying for what I want in a cookie. I know this is quite subjective. Frankly, there are many different styles, sizes, and textures for chocolate chip cookies and I enjoy many of them. But there are a few qualities that are most important to me. I’ve played around with “aging” chocolate chip cookie dough after reading articles about how much better it makes the cookies. Maybe a little, but truthfully, I care most about how fast a recipe is. I hate waiting for doughs to chill. I am impatient. Me want cookie NOW. So this recipe is quick. There’s no chilling whatsoever, and you don’t even have to set out butter ahead of time to soften, as this recipe uses melted butter. Sure, every once in a while I’ll crave those crispy Tate’s-style cookies that are completely crunchy the whole way through, but my ideal cookie has crispness, softness, and gooeyness. These cookies have a crunchy edge, with a soft, melty, gooey interior. You can also bake a little less or a little more to get it even closer to your preference, if you like it one way over the other. I’ve seen various “secret ingredients” and little tricks claiming to make chocolate chip cookies different, but none that I’ve tried have proved to be worthwhile. This cookie has only the classic ingredients: butter, sugar, flour, egg, vanilla, baking soda, salt, and chocolate chips. No cornstarch, no cream cheese, no boiling water, no cinnamon (?! ), no cream of tartar, no lemon (why?!?! ), and so on. For equipment, you really just need the simple things, like bowls, a whisk, and a spatula. I whip the cookies up with a hand mixer, but you can totally do this by hand too. Melted butter instead of softened gives it a nice chewiness, and my favorite texture. A 2:1 ratio of brown sugar to granulated sugar also gives it a chewier, softer texture. Don’t worry, these aren’t crazy chewy like Molasses Cookies, it’s subtle. Scooped mounds of cookie dough gives the cookies ridges, an awesome texture, and somehow, a more even bake. Don’t roll the cookies. After testing these cookies on multiple cooking surfaces, I find that they brown best and spread the least on a Silpat. You may use parchment paper or bake directly on the pan though, if you’d like, but there will be slight variations with each surface. I quickly warm the egg by putting it in warm water for a few minutes. Otherwise, a cold egg straight from the fridge will solidify the melted butter and make it uneven. I tested rolling them into smooth balls in the palms of my hands, and it is MUCH better scooped. The little ridges and unevenness here somehow gives it a more even, desirable bake in the oven. 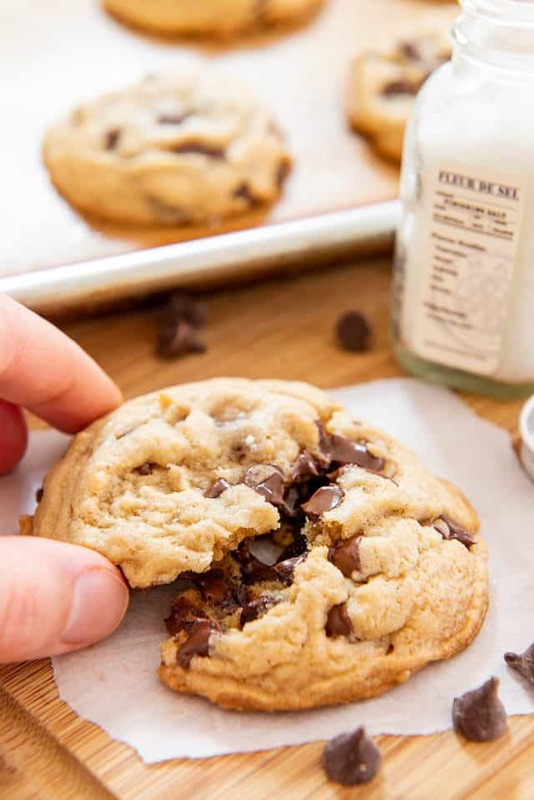 Sprinkle the tops with fleur de sel, if you really want stellar cookies. The salt is so lovely. Bake the cookies for about 11-12 minutes. Even though it may look too soon to pull from the oven, that is the perfect time to pull them. The cookies will cook a little bit more outside the oven, and after a few minutes, the domed shape will fall a little bit. I think they are best when enjoyed warm, so dig in! Peanut Butter Cookies, Monster Cookies, and Snickerdoodles are some of my other favorite cookies to bake, fresh out of the oven. Enjoy! How well do these Chocolate Chip Cookies store? You can keep these at room temperature, in an airtight container, for several days, and they’ll still be soft and delicious. They are best fresh out of the oven, but leftovers are easily devoured too. 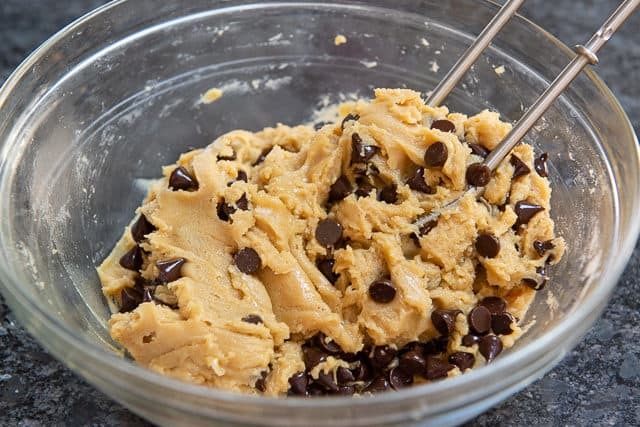 Freezing cookie dough: Like other chocolate chip cookie recipes, dough scoops can be frozen and baked later, with a few more minutes of bake time added at the end. I find that they don’t spread as evenly as freshly baked though. 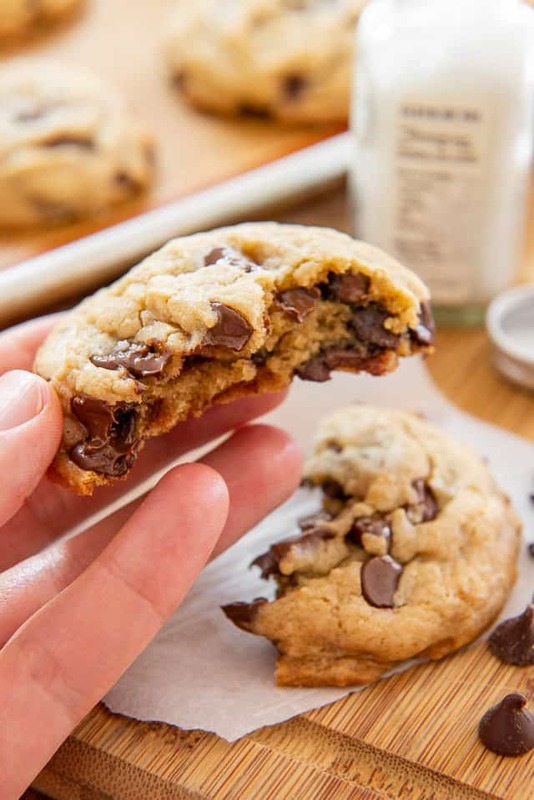 These Chocolate Chip Cookies are soft and gooey in the middle, crisp on the edges, and loaded with chocolate chips. In a large heatproof bowl, melt the butter in the microwave until it's just barely melted, watching closely that it doesn't come to a boil or get too hot. If the butter becomes overheated, make sure you let it cool down before proceeding. 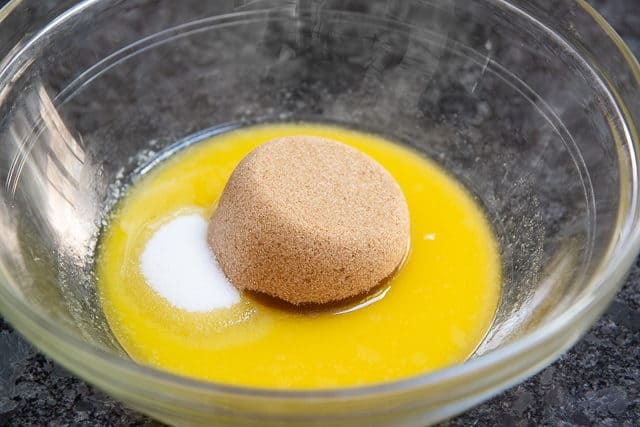 Add the brown sugar and granulated sugar to the bowl, and mix to combine, either with a hand mixer or by hand with a whisk. Only mix it just enough so that it's relatively smooth. Add the vanilla extract and egg, and mix again until just combined. 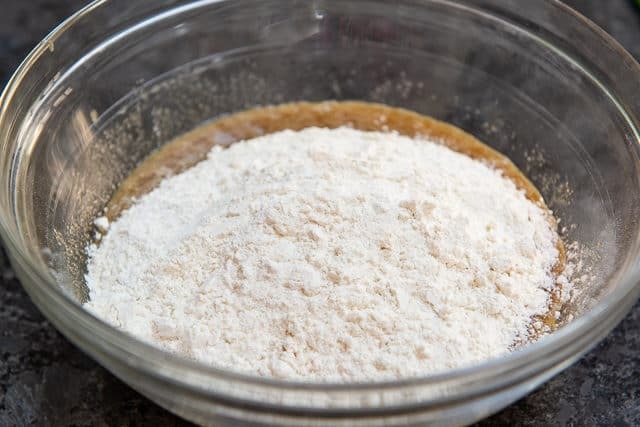 In a separate bowl, whisk to combine the flour, baking soda, and salt, then add this to the wet ingredients. 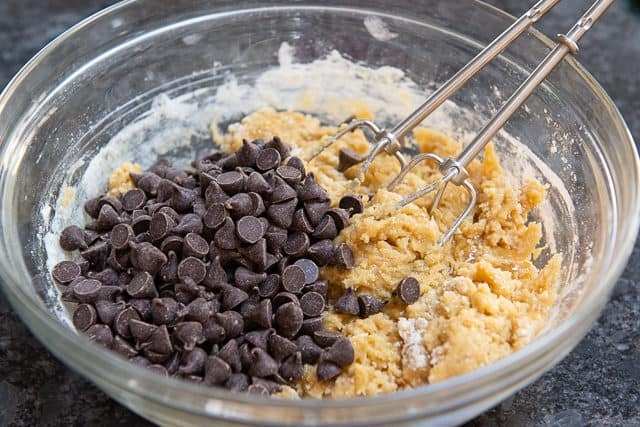 Stir until the flour has almost disappeared, then add the chocolate chips, and continue stirring until the dry ingredients have been absorbed. 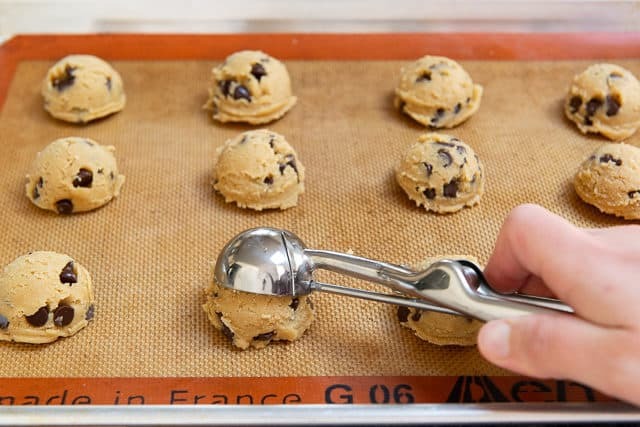 Use a medium scoop (#40/1.5T) to portion the cookie dough onto the prepared baking sheet. You should get around 18 cookies, so you can either bake two batches one after another (my preference) or add another baking tray. 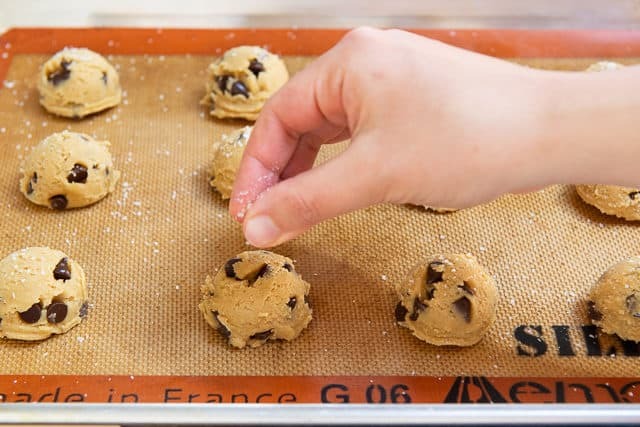 Sprinkle the tops of the cookies with fleur de sel, if using, then bake for 11-12 minutes, until the cookies look slightly golden on the edges, and soft in the middle, but with no visible glistening rawness in the center. Remove the cookies from the oven, and allow them to cool for a few minutes, during which time they'll flatten a bit and cook a little more. Then enjoy while warm! *No need to remember to pull the egg out in advance. Just put the egg in a bowl of warm water for a few minutes, and it's ready to go. 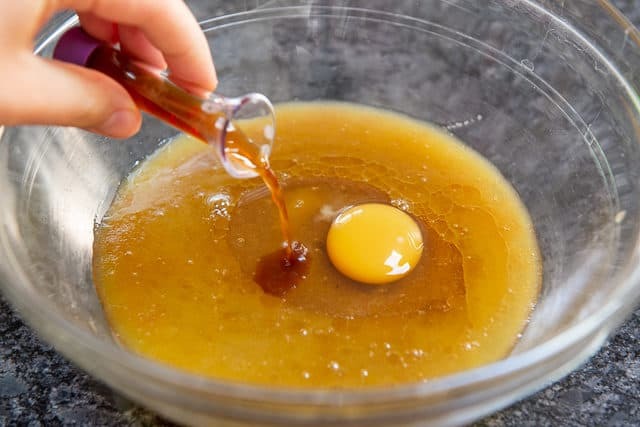 The reason we warm the egg slightly is because otherwise a cold egg from the fridge will re-solidify some of the melted butter, and we want to keep everything smooth. 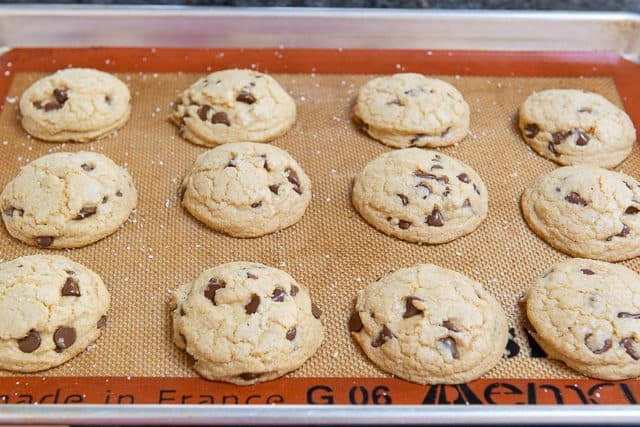 **I have tested this recipe on several baking surfaces, and I find that the cookies brown the best on the bottom and spread the least when baked on a silicone mat, like a Silpat. 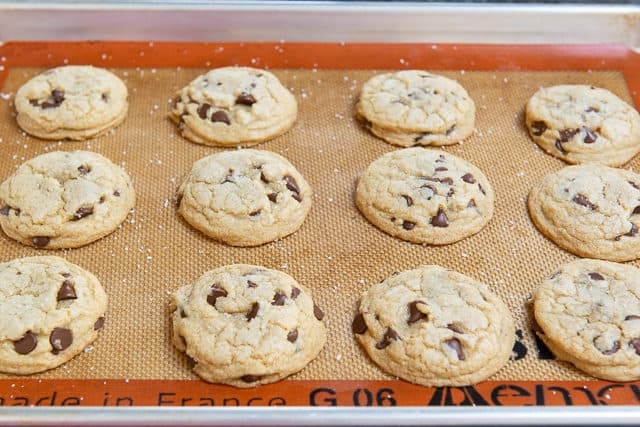 Parchment paper is the second best option, followed by directly baking on the sheet pan. The cookies will turn out fine on any baking surface, just know there will be slight variations. Post updated in March 2019. Originally published December 2010. If I wanted to add peanut butter to this do you think I’d have to change any of the ingredient amounts?? Ok so I’m totally lovin all of your recipes! I’ve used three of them this past week since being introduced to your site! So we got on a chocolate roll last night, first the peanut butter cups and then then these wonderful cookies. Chocolate chip cookies are my favorite (I know along with millions of other ppl) and I’ve searched FOREVER looking for that perfect homemade recipe, you know the one that comes out like the store bought box or refrigerated kind or the expensive mall shops. But we try to watch our sugar and “other” intake so I rarely indulge and plus we live overseas so some of those delights are not readily available. I’ve even tried the “clones” and the ones on the chocolate chip packages but still haven’t been satisfied. But anyway….again I love, love, love this recipe, the search is finally over! They came out perfect, a little crisp on the outside and soft inside. What more could you ask for?? 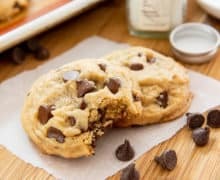 If you are on the fence thinking just another chocolate chip cookie recipe, jump on over and join us, this is a good one! Hands down the best chocolate chip cookie recipe I have ever tried. My boyfriend and I have been experimenting with recipes for the past year, and when we tasted this one we immediately knew it was the best. We used a GF flour mixture and melted the butter (no mixer), and they were absolutely perfect. Thanks for this awesome recipe Joanne!! That’s so great, Ellen. I’m glad you two enjoyed the cookies so much! Just wondering if you recommend “aging” this cookie dough as you mentioned on another post. I would say to make this recipe as is. it’s just a different experience from the other cookies, but both are good.